NANGARHAR -- Nangarhar Province officials are taking a new approach to counter the cultivation of opium poppies. In previous years, officials launched campaigns to destroy poppy plants when farmers were beginning to harvest them. This year, they are eradicating poppy plants at the time of cultivation to give farmers time to plant other crops and to minimise those farmers' economic losses. 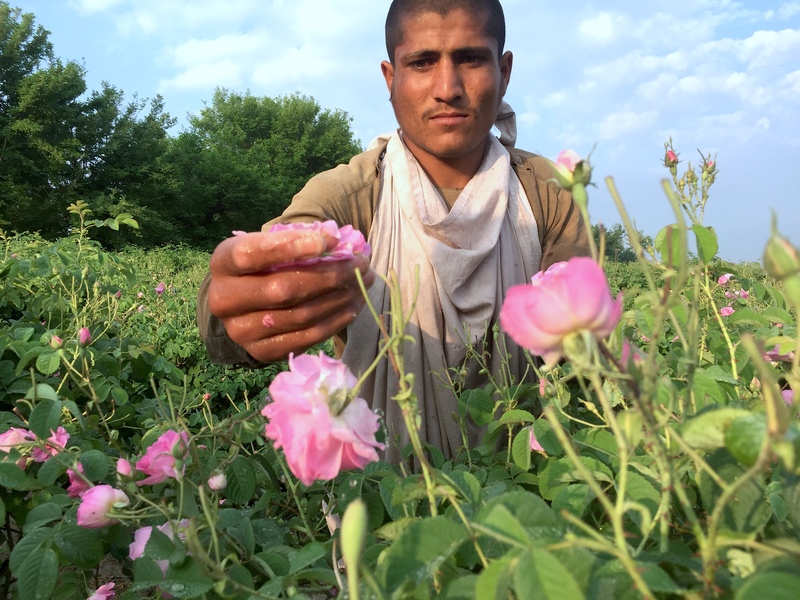 Farmers cultivated poppies on 14,000 hectares of land in Nangarhar Province in 2016, while Afghan forces eradicated only 20% of the crop, according to the Ministry of Counter Narcotics. The latest campaign, which began on December 17, so far has eliminated poppy plants cultivated on more than 500 jerib (247 acres) in Nangarhar and is continuing, according to local officials. "In previous years, the campaign was launched when the poppy crops were getting ready for collection," Surkh Rod District Governor Sayed Ali Akbar Sadat told Salaam Times. "At such a time, the farmers could neither cultivate other crops nor pursue another option." "This year was better because we launched the campaign only days after the cultivation of the poppy crops, and [we] witnessed that the farmers do not sustain much losses because they can cultivate wheat or other crops," he said. As a result of this innovative approach, the anti-poppy campaign "is going well", he said. "This year I promise that we will bring the poppy crops to zero in Surkh Rod District." Farmers have been planting vegetables in many areas of the district, and it has proved lucrative for them compared to wheat and corn crops, Sadat said. "We have distributed fertiliser and other equipment among the farmers so that they can cultivate their lands with [food crops]," he said. "But still, there are a number of unfortunate souls who are trying to cultivate this illegitimate crop and make money from it, though the farmers do not get even 2% of its benefits," Sadat said. 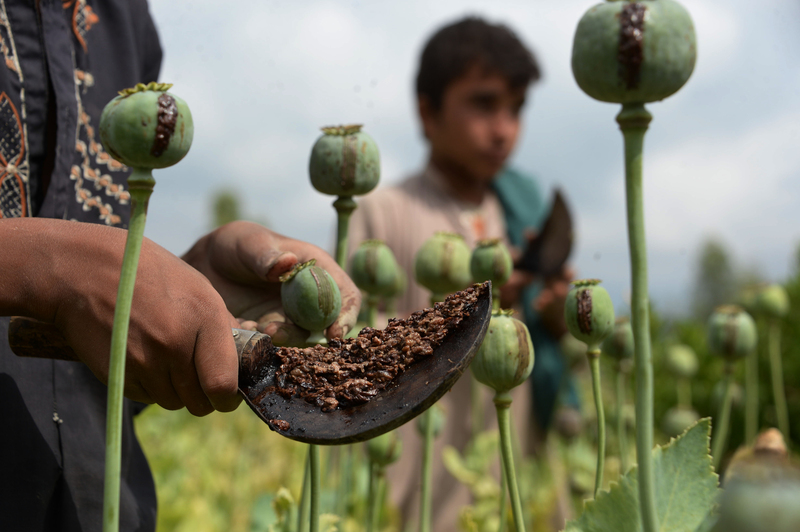 The Taliban notoriously force farmers to cultivate opium poppies and then reap practically all the profits from drug trafficking. "From one side, [the farmers] make themselves sinful by cultivating [poppies], and on the other side they obtain illegitimate gains for their children," Sadat said. Faqirullah, a 62-year-old farmer in Surkh Rod, saw his his poppy crop wiped out by the government but expressed relief that that the government was helping farmers plant planting alternative crops. "I feel deeply sorry [for planting poppies]," he told Salaam Times. "We won't grow poppies anymore." It was good that the government destroyed the poppy crop so early in the growing season because he could sow wheat seeds immediately, he said. "I lost only the fertiliser, but if they had destroyed [the poppy crop] after it matured, I would have taken big losses," he said, reiterating that he will no longer cultivate poppies. "I promise this to the government." Other residents of his neighbourhood lost their poppy crops to destruction by security forces, he said. "Now since the government destroyed [the poppy], farmers cultivate vegetables ... and some of the farmers cultivate wheat and corn," Faqirullah said. "When the vegetables ripen, we will be able to buy them cheaply [from our neighbours]." He called on the government to provide additional assistance because the local population is very poor. "Its assistance should reach us without any corruption," he said. "It is our government. We support it. We have supported it." The recent campaign is continuing in eight districts, said Mohammad Idrees Sapi, director of the Counter Narcotics Department of Nangarhar Province. "We destroyed up to 500 jerib (247 acres) of poppy crops in Khogyani, Sherzad, Surkh Rod, Darai Nur, Achin, Ghani Khel, Bati Kot and Hesarak districts, and we will continue," he told Salaam Times. "This year's campaign will continue until we eradicate poppy crops in all the areas we access," he said. "During the past month, we arrested up to 40 farmers who had cultivated poppy crops on their lands, and ... we received written pledges from the farmers that they will not cultivate poppy crops," Sapi said. "If they still cultivate them, they will be sent to jail." The government is working on providing alternative livelihoods. "With the help of the United Nations, $32 million (2.2 billion AFN) worth of projects will be implemented in Nangarhar Province in the coming year of 2018," Sapi said. "These projects will be chosen by the farmers so that they can benefit from them and stand on their own feet," he said. "This is a good programme, and its implementation will help to solve problems that many farmers have." 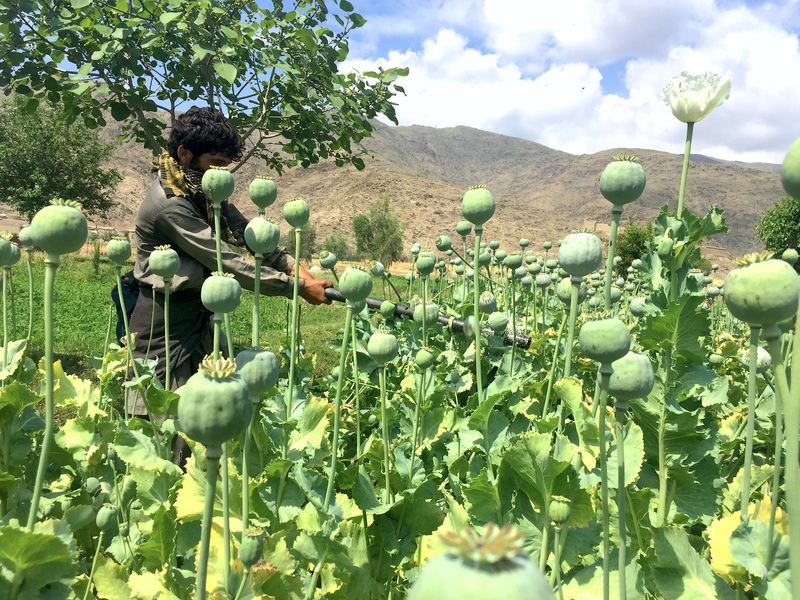 Counter-narcotics personnel are destroying poppy crops throughout Nangarhar Province.